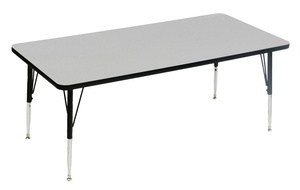 These tables are an economical alternative to the high pressure laminate activity tables. The 1 1/8" high-density particle board core makes them durable and the Melamine top makes them less expensive. They come with the same heavy duty legs as the more expensive alternatives.